There have been years when most of my choices are non-fiction or most of my choices are young adult, etc. etc. This year I was pretty balanced across the age ranges, but didn't find any non-fiction books that I really loved. It will be interesting to see what happens next year. 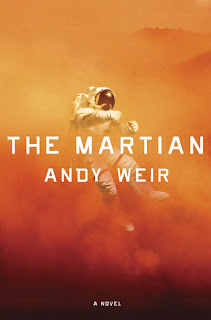 What were your favorite books of this year? At the beginning of this year, I stated that I would not be participating in the Goodreads Reading Challenge by making a goal of a certain number of books I had to read. I did this for many reasons, but the biggest one was so that I could read for enjoyment instead of reading for numbers. 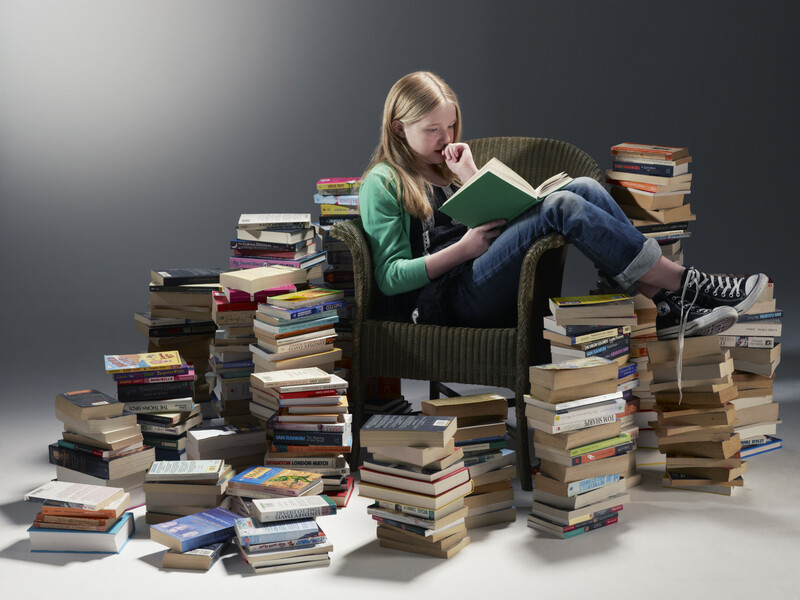 Last year I was too focused before on getting a large number of books read instead of savoring the ones I was reading. There it is. 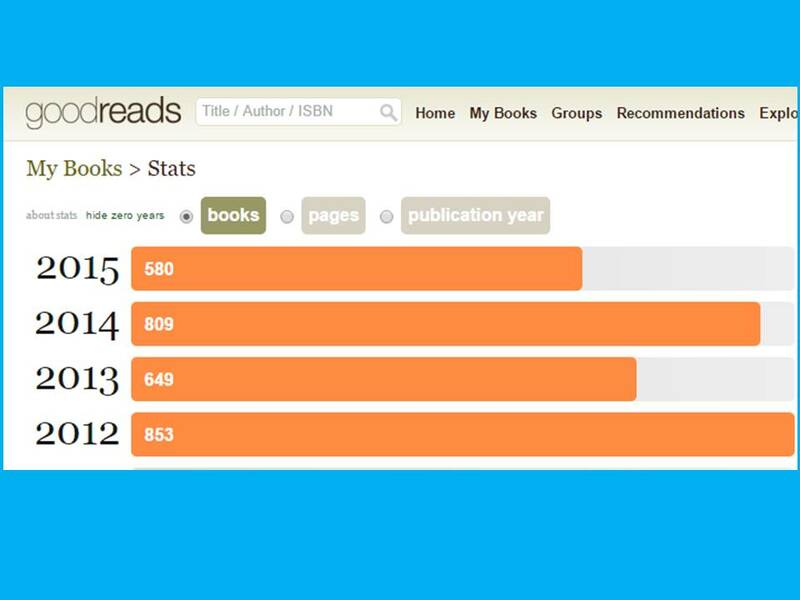 In 2014 I read over 800 books. This past year I read about 600. Granted, many of these books are picture books that I am using for storytime, so it doesn't exactly take that long to read them. 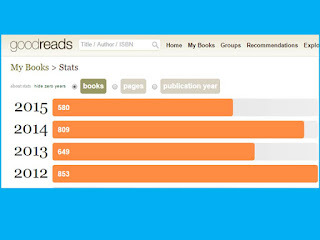 It's true that I read more than 200 more books in 2014 than in 2015, but I still read a lot in 2015. And the best part is that I can actually talk to you about what I read, because I was reading for a purpose, whether for pleasure or programming or to review a new book, but I didn't read a single book just to boost my Goodreads numbers. I am glad that I chose not to participate in the reading challenge, and I was still able to read a lot and enjoy the books. For some people, setting a goal on Goodreads or elsewhere is a way to ensure they will read a lot. In my case I don't think that's necessary. As a librarian, I definitely do not spend my whole day "sitting around reading books," as some might think, but I do have to read/peruse/review quite a few books as a part of my job. Confession: I did this storytime back in November, but I allowed the dinosaurs to take over my blog for that entire month, so only now am I posting details from storytimes and other events that took place in November. They spread their wings and tails just so. They strut to the left. They strut to the right. They stand outside in the bright sunlight. Along comes the cooking looking for something to eat. Run, little turkeys! Use your feet! He spreads his wings and walks like that. Song: "Head, Shoulders, Knees and Toes"
Our craft was simple. I gave each child a pre-cut turkey body. They cut out feathers of various colors and glued them to the back of the turkey body. The most popular turkey feather colors were orange, green, blue, and purple. Cohen, Marina. 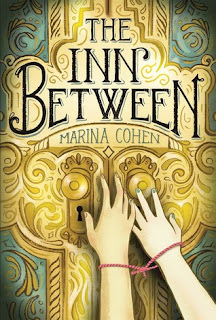 The Inn Between. Roaring Brook, 2015. Quinn is taking one last trip with her best friend Kara. She is traveling with Kara's family as they move to California. Quinn is glad to get away from her parents and the memories of her sister Emma, who has been missing now for a long time. The group stops at a hotel to stay overnight, but Quinn and Kara wake up to discover they're the only ones left at the hotel. What's going on, and how can they be reunited with their family? Goodreads describes this book as "supremely creepy." I disagree. It's mostly mysterious and mildly creepy. It would be an easy book to give to a tween who enjoys mysteries or who likes stories that are spooky but not completely scary. Red Flags: The people at the Inn Between are waiting to see if they live or die, which might be bothersome to some readers. Kreller, Susan. You Can't See the Elephants. G.P. Putnam BFYR, 2015. Mascha is languishing during her annual visit to her grandparents' small town. She is an outsider and has no one to play with during the summers she spends there. Then she meets two kids who have some strange bruises. She tries to tell, but no one believes her, until she decides to take matters into her own hands. Child abuse is a very real issue, and I found Julia and Max's family to be completely believable. Of course they were able to put on a front, and of course the sleepy little town chose to ignore it rather than make waves. Mascha definitely made some, ahem, unusual choices regarding how to help Julia and Max, but in the end, she really was the one who helped them. 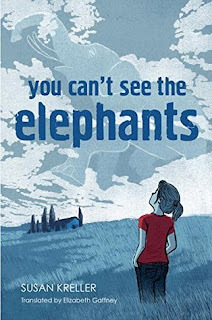 I liked that this book was told from a bystander's point of view, and while it is obvious what is happening with Julie and Max, it isn't graphic. Lukavics, Amy. 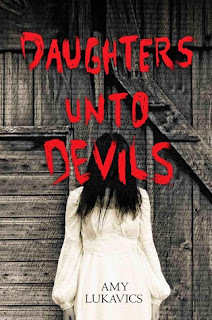 Daughters Unto Devils. Harlequin Teen, 2015. The cover of this book contains a blurb comparing it to a Little House and Stephen King mashup. That description actually fits. For the first part of the book, the story is pretty slow. It's obvious things have happened, but we don't get many of the details until much later. After the family settles in their midsize house on the prairie, though, things start going downhill, fast. The pacing picks up in the story and it delivers the punch of creepiness I'd expected from looking at the cover. 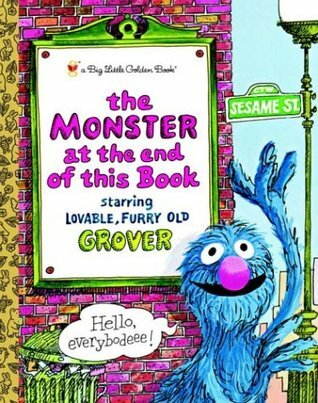 This would be a great book to recommend to all the kids who come in the library looking for "the section with all the scary books." 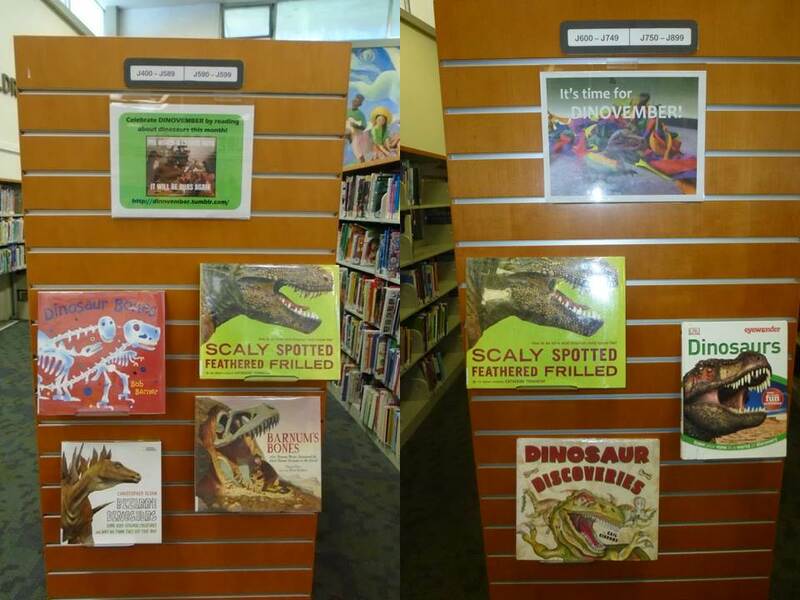 Our children's nonfiction and fiction shelving has built-in display areas on the endcaps of the shelves. 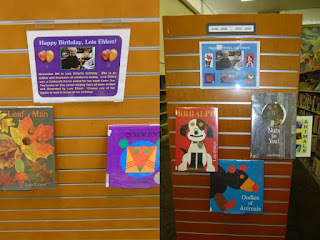 We have acrylic displays that can hold signs as well as book holders to use in these areas. I've been responsible for our endcap displays for over a year now, and I've definitely changed the way I've done these displays over the year. Way too many words on that sign. "Happy Birthday" and the author's name is sufficient. More pictures, fewer words. I put less description in the signage and utilize more pictures. 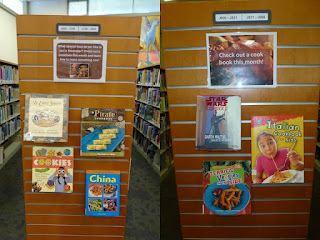 People are not likely to read the signs, but they can glance at the picture to figure out what the display is all about, and I will gladly point them to other books or more information if they want it. Less white space, more color. Even though Microsoft Publisher has 1-inch borders all around the page, I extended the pictures to include the entire page, then let the printer determine how much border I would need. The result is much less white space and more room for a better picture. Instead of a brown background and a small food picture, the picture IS the background. Rule of three. I only put three books on each display. Three is enough to give the idea of what the display is about and hopefully to get patrons interested in finding other books on the same topic. Three is visually satisfying as well. At the beginning of each month, I remove the display sign from the acrylic holder and replace it with a new sign. I have saved all of the signs from last year, and I'm gradually replacing them with (hopefully) better-looking signs that will be more attractive to our patrons. 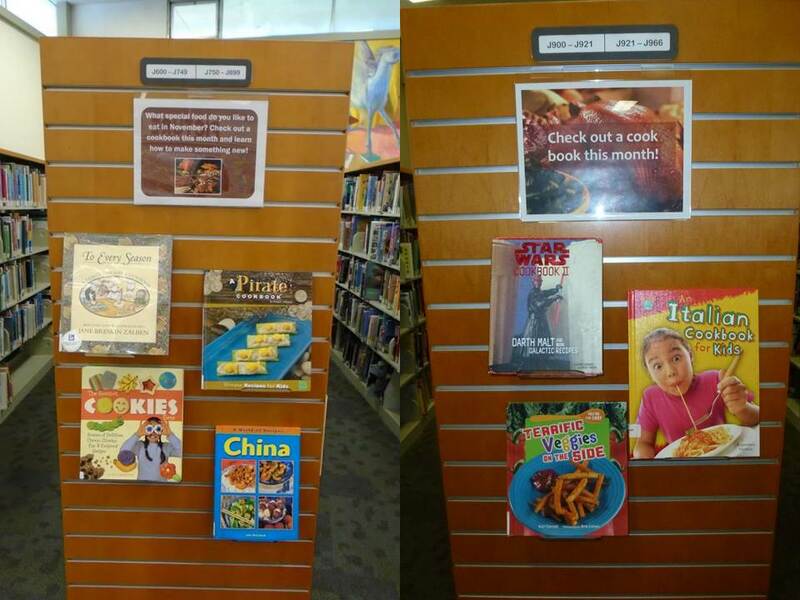 How do you display books in your library? Do you have some kind of stand-alone display that you change out on a regular basis? UPDATE: Here is a link to a Google Doc listing my monthly themes. I try to do one picture book author, two nonfiction topics, and one juvenile fiction author or topic per month, depending on how the month works out. Fly like a Pteranodon, soar and glide. Move like a Stegosaurus, long ago. 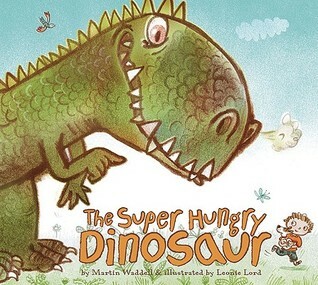 As tall as Apatosaurus eating on a tree. Just like Tyrannosaurus on the prowl. Dinosaur, dinosaur, stomp your feet. Dinosaur, dinosaur, show your teeth. Dinosaur, dinosaur, swing your tail. Dinosaur, dinosaur, touch your scales. Dinosaur, dinosaur, show your claws. Dinosaur, dinosaur, open your jaws. Dinosaur, dinosaur, give a roar. Dinosaur, dinosaur, sit on the floor. Craft: We made dinosaur feet! Cut out a dino foot shape on craft foam or cardstock, decorate, and wear home! Rivers, Karen. 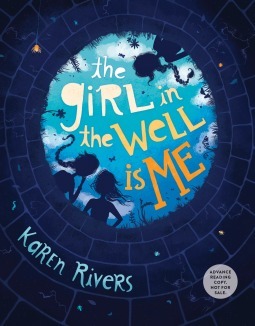 The Girl in the Well is Me. Algonquin BFYR, 2015. 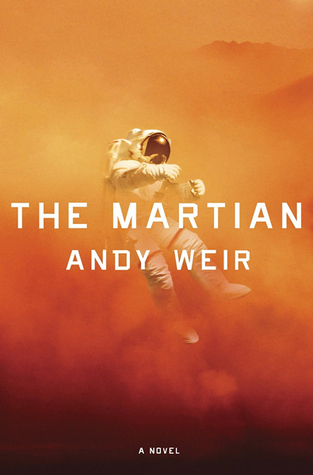 This book is an acquired taste, but is recommended for strong readers. Kammie is down in a well. She was trying to get in with the popular girls at school and ended up falling in a well. The story takes place in Kammie's thoughts as she is stuck in the well throughout an entire day and night, including visions she has when she is low on oxygen. Eventually, the reader learns why Kammie is in that town, why she tried to become a popular kid, and how she got trapped in the well. There are very few middle grade books featuring incarcerated parents, so I was pleased about that aspect of this book. And eventually it was good to hear how Kammie ended up in this town and how hard it was for her to leave her old life behind when her family moved and her mom started working at what sounds like an Amazon warehouse. And of course there's the bullying/mean girls aspect. But a lot of this story is just so odd. The reader is trapped in this well with Kammie and has only Kammie's distracted thoughts to listen to as the sky grows dark and Kammie slips further into the well. I would have enjoyed this story more if it had started with Kammie in the well, then flashed back to her past and caught us up with what was going on, ending with her eventual rescue. The scattered bits of her past that had to be gleaned in between spiders crawling on her un-shoed foot and her oxygen-deprived hallucinations were just difficult to follow. This story would be even more difficult for a child to comprehend and follow. I won't be using this book in my book club, and I probably won't recommend it to any but the strongest of middle grade readers. Bottom Line: Check it out from the library if you're curious, but don't purchase it. Not me or my storytime, but a good representative picture nonetheless. I am responsible for the weekly family storytime at my library. 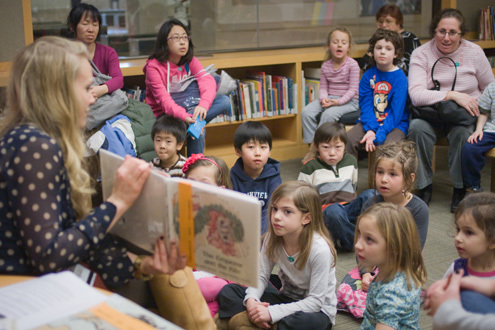 Every week I see 15-20 families who faithfully arrive at our library's auditorium for our storytime and craft. I inherited this storytime from a longtime library employee, so I had some big shoes to fill. I've realized the most difficult part of storytime isn't running the storytime itself; it's the planning. Storytime comes every week whether or not I'm ready for it, so I've had to devise a system for planning my storytimes. Two months ahead: Yes, I really do start planning storytime two months in advance. Two months before storytime, I begin by 1) figuring out how many storytimes I will have in a particular month and 2) choosing tentative themes. 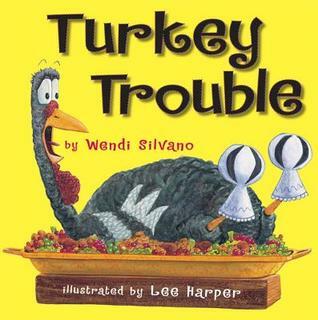 I try to do one storytime based on something seasonal, one based on an animal, one author study, and one generally involving some new book we've gotten in the collection. For five-storytime months I add in a common folk tale or fairy tale and its variations. This basic structure gives me something to start with when I'm picking themes. For example, for the month of November I had five storytimes. I did, in order, dinosaurs (for Dinovember), turkeys (animal), fall (seasonal), Kevin Henkes (author), and Three Little Pigs (folk tale). The next thing I do is choose the books I'll be reading. Yes, this means that right now, in December, I'm reading books that I'll be presenting in February, but this guarantees that I have enough time to find a variety of books to read. I try to read at least one nonfiction book when possible, even if it needs to be abridged a bit, and I read through anywhere from twelve to twenty books choosing the ones that are appropriate for my particular storytime group, which skews to the younger end of the spectrum. 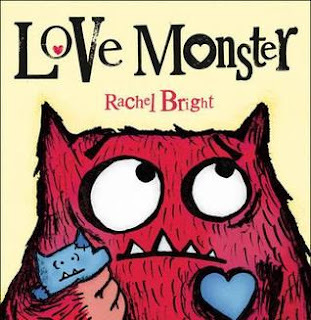 Some books are great one-on-one books but are too long for a group read, while some have a great story but the pictures will be hard for kids to see. In the end I try to choose 5-6 books that are all good possibilities for storytime. One month ahead: Now that I have my books chosen, it's time for me to find the other items: rhymes/fingerplays and a craft. I always open and close with the same rhyme, and we always sing the same two "get the wiggles out" songs during storytime, but I like to add one or two rhymes that match the theme. This is where the wealth of the internet and the shared knowledge base comes in. I can find just about anything I need online, so one month ahead of my storytime I finalize my line-up of which books I'll read and which rhymes I'll do, and I choose a craft that looks fairly simple and not too material-heavy. Two weeks ahead: By this point I should have created a sample of the craft and should have the storytime line-up typed and printed. I print these out so that I have a record in case of computer failure and also so that anyone who needs to can step in and take over if I'm ill or there's an emergency. I also create a Power Point presentation with the lyrics to all songs and rhymes as well as titles of the books we'll be reading. This allows parents to follow along and helps me get participation when we're reciting a rhyme together. I also make sure that we either already have all of the craft supplies or can easily obtain them within the next two weeks. The week before: My storytime happens on Monday night, so I like to have things ready to go by Thursday of the week before. I pile up the books I'll be reading, the memory stick with my power point on it, the sample craft and a list of supplies to grab on Monday, and I put all of this in a bin by my desk. I rotate the bins so the next upcoming program is the first on the shelf, and each bin after that represents another program. Once a program is over, I rotate that bin to the end and begin compiling items for that program. The day of: I choose books to place as display items in the back of our storytime room. I gather our boxes of markers/scissors/glue sticks, as well as any other random craft supplies I haven't yet collected, and put all of that on a cart along with my storytime bin. I double check my Power Point presentation against my line-up and make sure I have all the technological equipment ready to go as well. Then all that's left is to make sure our sign-in sheet is out, the CD player has a Raffi CD in it, and the rugs/chairs have been set out. Planning this way means I'm always thinking one or two months down the road, but it leaves plenty of time for me to adjust if a craft is too complicated or there aren't enough books on a particular topic or something new and exciting comes up that just begs to be done at storytime. I save all of my storytime plans both electronically and on paper copies (just one sheet of paper per week) so that I can reuse or revisit them as needed. How about you? What does your planning timeline look like? Squishy, squashy, felt so good. The farmer took one piggy out. 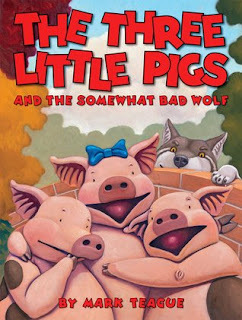 "Oink, oink, oink," the pig did shout! No little pigs rolled in the mud. They all looked so clean and good. Those pigs rolled in the mud again! I also considered, but did not use, The Three Little Wolves and the Big Bad Pig, Eco-Wolf and the Three Pigs, The Three Little Pigs: An Architectural Tale, Wait! 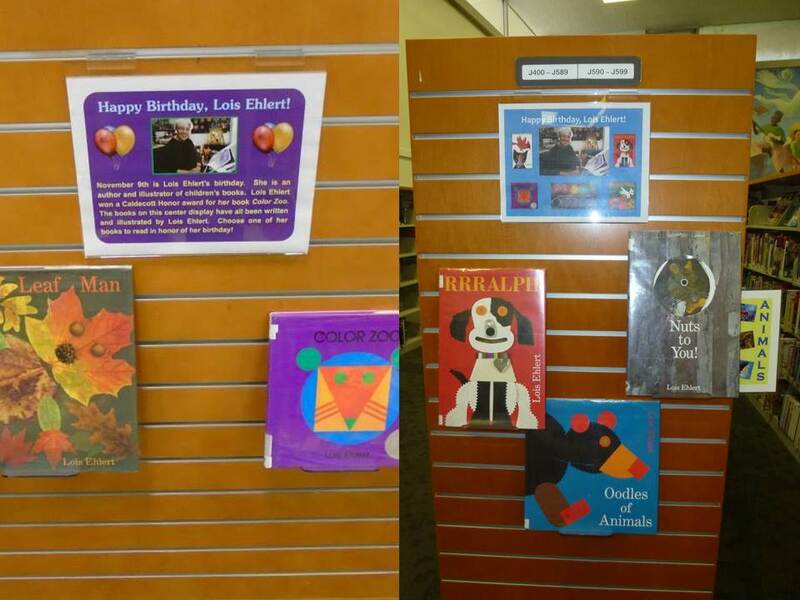 No Paint!, Three Little Cajun Pigs, and a score of other books which I put on display for patrons to check out after storytime. After storytime, it was time for our craft. I borrowed the three pigs and wolf puppets from this site, and then I made my own version of the three houses. My houses are a fold and tape or fold and glue craft, but this allows for more free play than just doing a puppet show. The best part is that the houses can be used for other crafts or play as well. Animal Match Game: We matched animal names to the tracks they make. This was a good literacy activity in addition to the matching (which I saw several adults doing on their own as well). Make a Snow Scene: I showed the kids how to cut a white paper in half to make the "snow" part of the scene, then glued it onto a light blue paper that became the "sky." Snowflake stamps and markers allowed them to dress up their snow scene however they wanted. Monsters galore, can you roar? Monsters galore, can you soar? Monsters galore, please shut the door. Monsters galore, fall on the floor. Big yellow moon, your turn is done. Here comes Mr. Morning Sun. I wake up. You go to bed. "Sleep well, Moon, you sleepyhead." 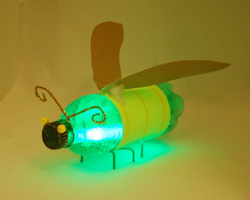 For our craft, we used old plastic water bottles and decorated them like bugs by adding eyes, antennae, etc. Then I gave each child a glow stick to put in their bug so they could use it as a nightlight to chase away the dark. Read with a box of tissues. 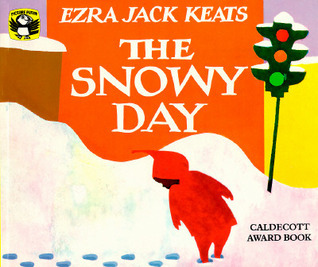 Jack's parents decide to become foster parents to a boy named Joseph who is nearly the same age as Jack. Joseph is leaving behind a sordid past, an abusive father, and his newborn daughter, whom he has never, ever seen. Jack's family tries to help Joseph heal as Joseph looks for his daughter, Jupiter. This book, similar to other of Schmidt's work, was very sad and dealt with some big issues. I appreciated the way that Joseph was portrayed - as an intelligent but wounded kid who was broken by his family and the system in which he was placed. Joseph's quirks - not allowing anyone to stand behind him, cringing when people touch him - were very realistically portrayed. The ending was sudden and sad, but not all that surprising. 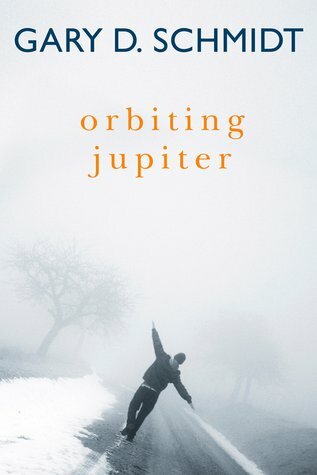 I wished this book were a bit longer so there would be more time to explore the life of this boy who has been hurt so much by those around him and who just wants to be a father to his daughter.